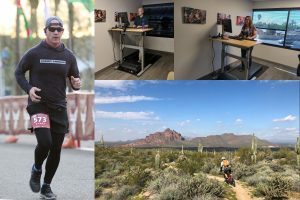 Our contest challenged each participant to complete 30 minutes of exercise for 30 consecutive workdays using our office treadmill desk or the activity of their choice outside of the office. Each participant pledged 50 Bonusly points, a reward system that we use here at Total Networks which can be used to purchase gift cards. For anyone that didn’t complete the challenge, their 50 Bonusly points were forfeited and awarded to those that completed the full 30 days. While we had participation from all departments here at Total Networks, we had four participants that showed true consistency and commitment and completed the 30-for-30 challenge without missing a day– Sharon, Aaron, Paul and Scott N. Each of them were awarded their share of the collected Bonusly points. By promoting activities such as this, we hope to make Total Networks a happy and healthy place to work!